(NaturalNews) The lawless entity posing as the federal government has issued a new guideline pertaining to the distribution of funding for disaster and emergency preparedness that crystallizes the man-made climate change myth. States that refuse to acknowledge and assess the "long-term vulnerability" caused by global warming may be refused federal funding from the Federal Emergency Management Agency (FEMA) for emergency preparedness, according to new reports. Under the leadership of the Obama Administration, FEMA is now mandating that states conduct a new type of risk assessment that includes "consideration of changing environmental or climate conditions that may affect and influence the long-term vulnerability from hazards in the state." Any states that refuse to comply with this mandate face being cut off from the gravy train for preemptive emergency preparedness. FEMA's 2008 guidelines for emergency preparedness funding did not include this assessment requirement. But those set to go into effect in March 2016 will, according to The Washington Times, which puts so-called "conservative" states (many of which more closely resemble neo-conservative fascist states, but that's a topic for another article) in a bind. FEMA says it "recognizes there exists inherent uncertainty about future conditions, and will work with states to identify tools and approaches that enable decision-making to reduce risks and increase resilience from a changing climate," according to an official statement issued by the agency. "An understanding of vulnerabilities will assist with prioritizing mitigation actions and policies that reduce risk from future events." 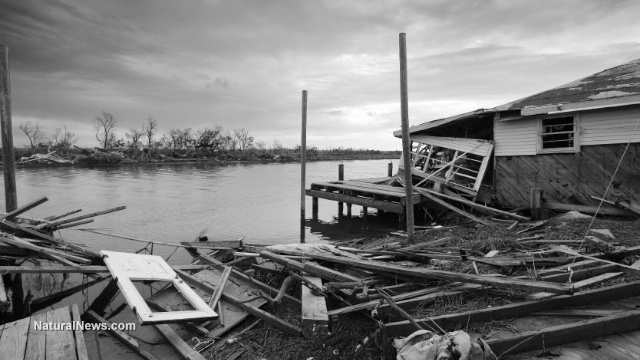 While the new rules won't affect federal monies issued for disaster relief in the event of a major hurricane, flood or other natural disaster, they will affect monies distributed for disaster preparedness. The states that face exclusion under the new rules are mostly those governed by neo-conservative Republicans, including Florida (Rick Scott), Louisiana (Bobby Jindal), New Jersey (Chris Christie), North Carolina (Pat McCrory) and Texas (Greg Abbott). But not everyone agrees that the new mandate specifically targets climate change-deniers. Michael Gerrard, director of the Sabin Center for Climate Change Law at Columbia Law School in New York City, told Arkansas Business that he believes FEMA is only trying to protect scarce funding from being expended in states that deliberately fail to prepare for potential future disasters. "It puts some states in a bind because if they want the FEMA money they're going to have to plan for future weather events of the sort that climate change can cause," Gerrard is quoted as saying. "They are not compelled to use the words 'climate change,' but they do need to look at the predictions for sea-level rise, extreme precipitation, extreme heat and other events that climate change is predicted to cause." "If a state refuses to anticipate and plan for extreme events and then one happens and there's injury, there's the possibility that the state could be liable for refusing to plan," he added. FEMA agrees, emphasizing that states need to actively update their infrastructures to be able to sustain a major disaster. While bureaucratic officials claim man-made climate change could be a factor in triggering such a disaster, anything can happen at any time, including unexpected weather events that occur randomly, as evidenced all throughout history, long before terminology like global warming became pop-culture vernacular.